Read more about Senza Gluten and all of our NYC picks in New York City: The Gluten-Free Guide, available now on Amazon. With a name like Senza Gluten (“without gluten”), you might think this spot only appeals to gluten-free eaters. Au contraire! While this New York City restaurant is indeed total heaven for gluten-free diners, its creative Italian fare is sure to excite even the non-foodies and gluten eaters at your table. After working for years to perfect his craft in Italian kitchens, Chef Jemiko Solo decided to take on the ultimate challenge. In late 2014, he and co-owner Teona Khaindrava opened Senza Gluten, a 100% gluten-free Italian restaurant in Greenwich Village. From antipasti to pastas to sweet finishes, each dish will defy your expectations of how delicious gluten-free cuisine can be. 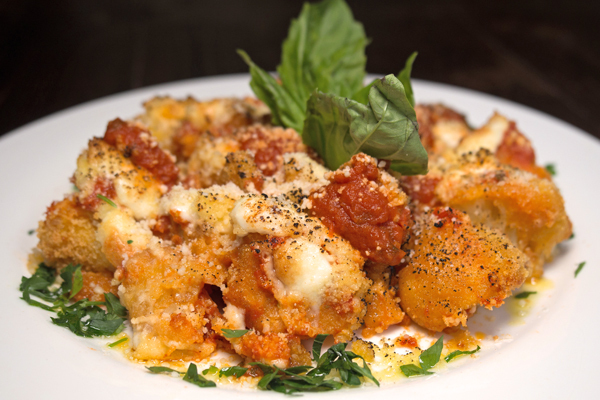 Many of Senza Gluten’s dishes are exactly the sort of thing you just can’t find anywhere else. 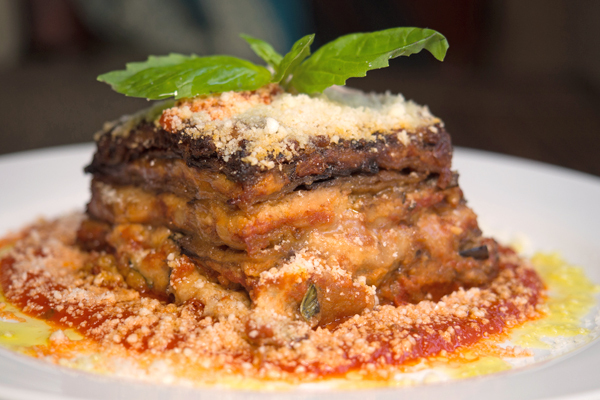 The parmigiana di melanzane, or eggplant parmesan, is one — but that’s not the only reason it’s a must-order. With thinly sliced and lightly breaded eggplant, fresh marinara, and ample mozzarella and parmesan cheese, this is one of the richest appetizers we’ve ever tried. And if you love layered dishes, you’ll be happy to know that this isn’t the only item on the menu. Be sure to order the lasagna as your main course, and enjoy the delicate pasta with hearty bolognese sauce and cheese. A unique take on a parmigiana dish, the cavolfiore alla parmigiana includes generously breaded cauliflower with buffalo mozzarella and a red sauce. If, like me, you don’t eat many breaded or fried items when dining out for fear of cross-contamination, this is an excellent choice. There’s no need to worry about gluten-related cross-contamination here, since there’s no gluten in the kitchen or elsewhere in the restaurant. Besides, have you ever seen such a decadent way to enjoy cauliflower? Chef Jemiko serves perfectly seared steaks, grilled lamb chops, and market fresh fish, but we couldn’t resist indulging in his pasta dishes as our main course. 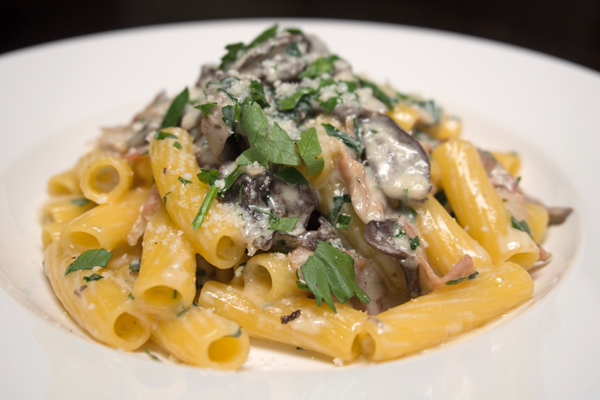 We could eat this rigatoni ai funghi e prosciutto all day. It’s deliciously creamy, with plenty of almost-meaty mushrooms and actually meaty prosciutto, and the truffle oil gives this pasta dish an extra ten layers of richness. 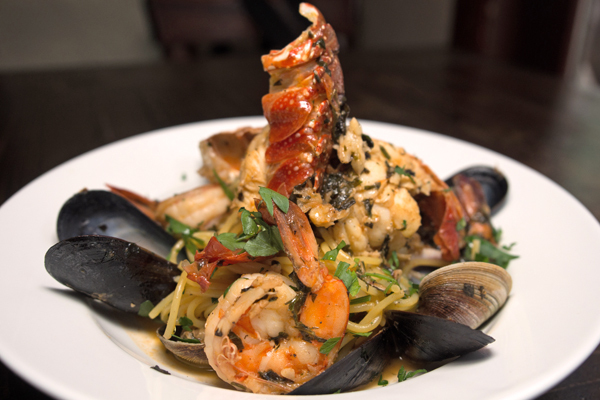 An impressive twist on a classic dish, Senza Gluten takes spaghetti alle vongole up a few notches by adding shrimp, mussels, and lobster. The spaghetti is just al dente, and the white wine sauce is surprisingly complex and flavorful. We couldn’t think of a better date night dish — just be sure to save room for dessert. 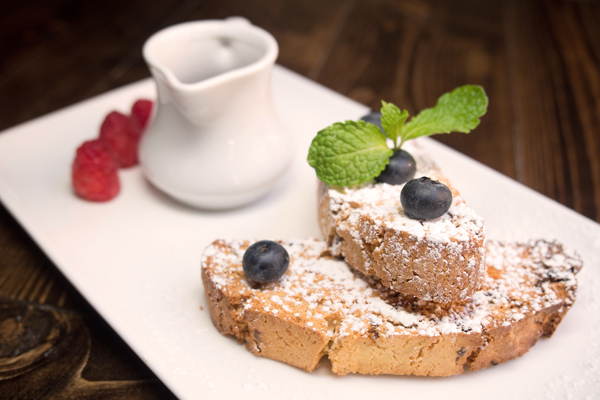 If you’re a biscotti fan, you’ll love the biscotti e cioccolato. A sweet and crunchy dessert with chocolate sauce to drizzle over top, this is the ideal accompaniment to an after dinner espresso. 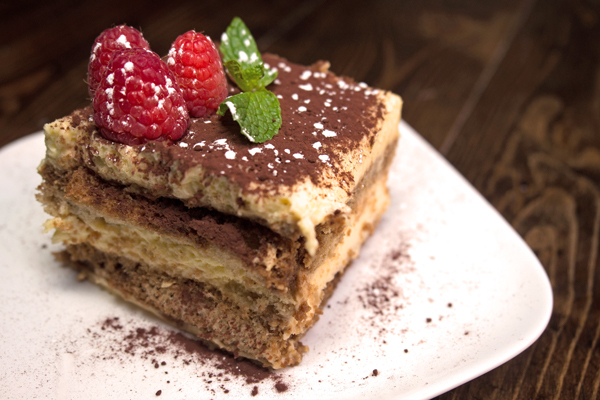 If you’ve saved room to indulge a little more, though, absolutely do not miss the tiramisu. With soft, spongey homemade ladyfingers, layers of mascarpone cheese, and plenty of chocolate and fresh fruit, this tiramisu is the real deal. We can’t imagine a better way to finish an amazingly delicious meal, and we can’t wait to return to sample more. Where? 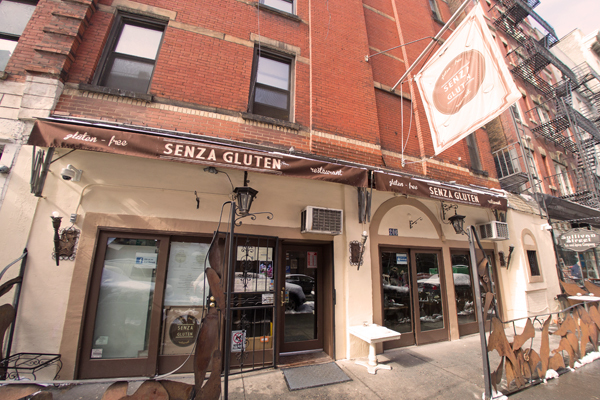 Don’t miss Senza Gluten in Greenwich Village at 206 Sullivan St, New York, NY 10012 (212-475-7775). Disclaimer: Senza Gluten graciously hosted us so that we could share our experience with gluten-free readers around the world. As always, all opinions and enthusiasm are our own.